The idea of a boodle fight can be overwhelming. Vast amounts of food, dumped on banana leaves, to be attacked by all. Attack is the only proper way to refer to it—there is no way you can be poised and refined when boodlefighting. Blackbeard’s Seafood Island takes this proud military tradition and downscales it for smaller groups with their Boodle Feasts; shared group meals that’s good for 3-4 or 5-6. These are the kinds of meals students at military friendly colleges will appreciate. Stepping inside Blackbeard’s, we had no idea about what to eat. We just wanted to explore someplace new. The Boodle Feast sounded good; a little bit of everything to please everyone. On the bright side, you don’t need to stink up your house for Balo-balo. 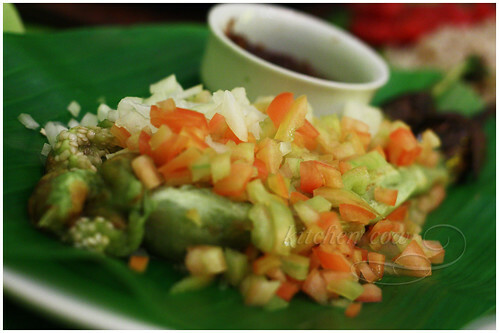 They have a wide selection of Boodle Feasts, following different themes. We had the Federosa. I can only assume that it’s their Kapampangan themed boodle feast. It had sisig, tocino, inihaw na hito (grilled catfish), halabos na hipon (steamed shrimp), balo-balo (fermented fish), mango mix, atchara (pickled vegetables), itlog na maalat (salted eggs) and sliced tomatoes. Served with it is a large amount of rice, both plain and garlic fried rice. Overwhelming, yes? 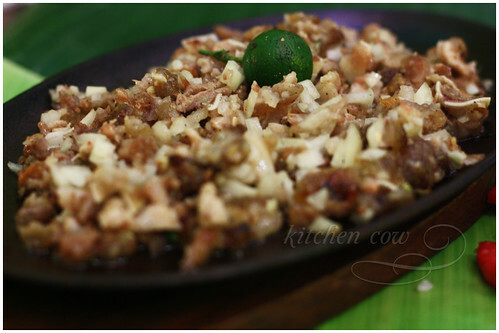 Who would want to pass up on Inihaw na Talong? Did we conquer the feast, or did we lose the battle? Unfortunately, we got outboodled as we had a lot of leftovers, but we put up a really good fight. Judging by the contented sighs and discrete burps, it was a winner of a meal. More than just a multitude of dishes, it was a delicious feast. It delivered on quantity, variety, taste and even value for money. Highly recommended. Dayap. 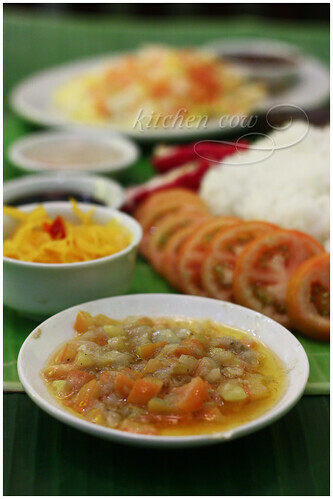 Not just for leche flan! They have normal ala carte options too, but I’m not too sure about their value. We came back and ordered some normal dishes and I found it a bit pricier. It doesn’t break the bank, but it’s not as affordable as I’d like. Oh, and their dayap shake deserves special mention. 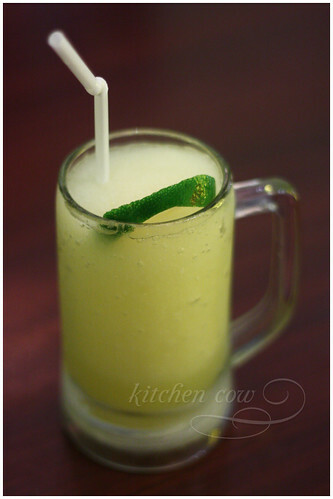 It packs a punch, being both flavorful and refreshing. It’s perfect for washing down this gluttonous feast. So, be ready to throw down the gauntlet—then wash your hands well, and be ready to challenge this evil feast. This entry was posted in restos & eateries and tagged alabang, balo balo, banana leaves, blackbeard, boodle, boodle feast, boodle fight, catfish, communal plate, feast, fermented fish, fiesta, filipino food, hito, manila, philippines, seafood, seafood island, shared food, sisig, tocino, westgate. Bookmark the permalink. 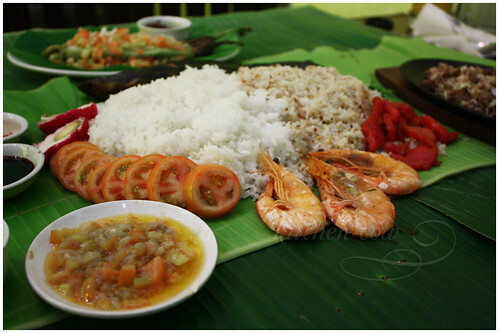 14 Responses to Blackbeard’s Seafood Island: Boodle Feast Food Attack! I missed boodle fights a lot! They are certainly the most fun way to eat and bond with your companions! Waaah! I already miss that place. Perfect for my appetite. Lol. hmmnn.. I have to try this.. Damn.. for 20 years of living here, I’ve never had a boodle fight… Curses! I’ve always looked at the Araneta Center branch with mild curiosity, a curiosity that, unfortunately, has never been appeased. I agree. It definitely brightens up the eating experience. I hope you get a chance. I’m curious to try the other meals as well. Why not do it yourself? 😀 Boodlefight, Arizona-style! I’ve seen some people swear by their Crab dishes. Apparently, it’s owned by Red Crab. Maybe it’s time to give in? Hi!I’d like to invite you to have dinner at Seafood Island CUBAO.Free pitcher of iced tea for every boodle!Just for you!just take a picture of this message and present to the server!You could contact us at 9135701!see you there! I hope you get to do so, yannracso. It’s such a pinoy thing. we just ate at seafood island 2 days ago at sm masinag branch. we dine in and had ordered for take out. but unfortunately, the contents of the food for take out is not complete compare to what’s on their menu. we ordered for tali beach and i am ninoy. Sad to hear that, Jayleen. Perhaps you can mention it to their management next time, so it doesn’t happen again.